Wow! This year has really gone by quickly! I have barely started even thinking about the holidays, but I know I need to start getting things done. I hope I can find the perfect gift for everyone on my list. Many of us have friends or relatives that are a bit quirky, and they generally like an unusual gift rather than the standard. Parnote went to ThinkGeek to find his, but my favorite "unusual gift spot" is Bits and Pieces. This site started years ago as a catalog order company, but now, of course, they have a website. It has expanded from mostly jigsaw puzzles to toys and games, lawn art, weather instruments, gift items and much more. I have found a few I think are unusual, and all prices are in USD. If you want to know the temperature, but you don't want to mount a regular thermometer to the wall, this might be just the thing. 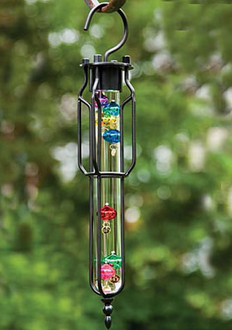 A Hanging Galileo Thermometer ($39.99) is a unique way to find the temperature. The glass spheres inside the tube rise and fall depending on the temperature. While we are outside (or close, anyway), I know people who like wind chimes or other movable art in the yard. 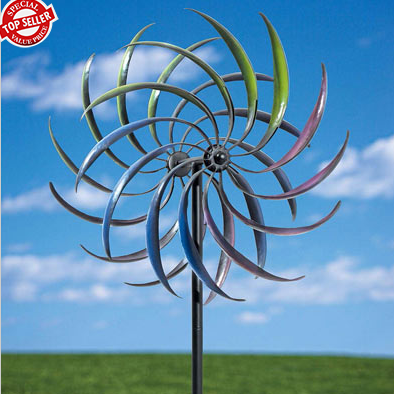 This Rainbow Windspinner ($69.99) could be the perfect addition to a friend's yard. It is 84 inches tall and 16.5 inches in diameter, so it won't be hard to see! Before we go back inside, let's play! 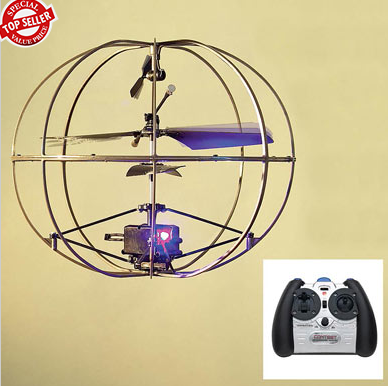 This Crash-Proof Remote Control Helicopter ($59.99) looks fun, especially for someone who's manual dexterity isn't great. 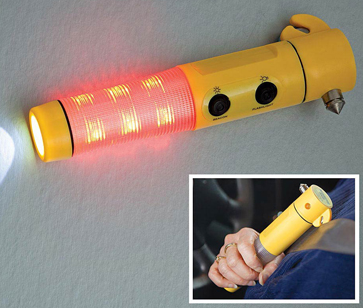 It is advertised as crash-proof, so it can be "bashed and smashed" into things without fear of damage. That is close to my skill level at controlling one of these things, anyway! While we are playing, let's play with something inside! These Electronic Drumsticks ($24.99) will let anyone emulate their favorite drummer. 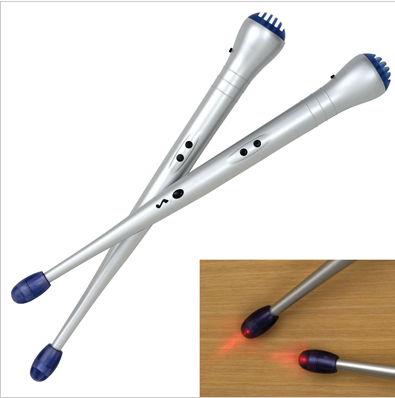 They are 13.75 inches long and light up on the ends with every beat. I guess I'm obsessed with the time, but I seem to have a clock in every room in my house (but oddly enough, I quit wearing a watch). If you want to give someone a clock and they are in favor of something a little different, this may be it. 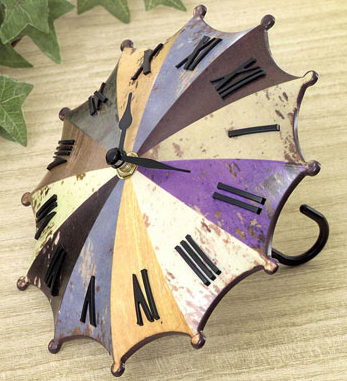 The Rainbow Umbrella Clock ($9.99) will sit on a table or shelf. Have you ever wanted to leave a note, but couldn't find any paper? 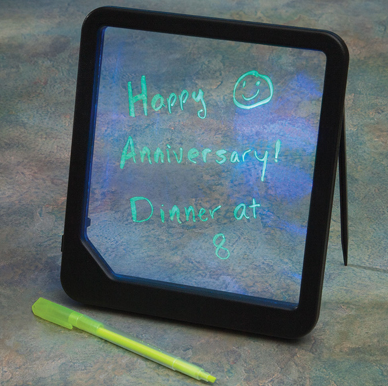 Try this LED Message Board ($9.99). Write your message with the stylus, stand it up with the support, place it where your friend or loved one will find it and turn it on. Your message will glow. Dimensions are 7.75 x 8.75 inches. I have plenty of them, but coffee mugs make good gifts. This Butterfly Mug ($6.99) changes colors as it gets hot or cools off. Bits and Pieces has a whole section of mugs! Some change colors and some have a different shape or feature and a few even emit animal noises. Have fun looking! While it's evident that this is my favorite site for unusual gifts, I do want to visit a few other sites. Not everyone is into the unusual. Hubby and I like to play cards. Generally there are only two of us playing, since the kids have left home, so we play Pitch and Rummy most of the time. Years ago we found a rummy style game that is really fun. We were playing it with two regular card decks and our friends called it Three-Thirteen. We later found that it had also been marketed by the Set Enterprises Game Company, and their version is called Five Crowns ($12.99). In this game there are five suits, and you play eleven rounds. Each round you are dealt a different number of cards (3 the first round, 4 the next and so on) and a different card is wild (3's the first time, 4's the next and so on up to Kings). You can only play your cards if you can play all of them, and everyone after that has one turn to play as many cards as they can. Your leftover card values are added and the winner is the one with the lowest score. Everyone can always use a new t-shirt. One of my new shirts this year will be a PCLinuxOS shirt from the PCLinuxOS Store. My favorite color is blue, but it is cold out now, so this black one black one is my chosen shirt ($25.99). All of us at the PCLinuxOS Magazine hope your holidays are filled with fun and happiness, and that you find exactly the right gift for each of your family and friends.